Grand Forks ND June 26 2013: NOSA hopes to complete their first sanctioned event in 2 weeks tomorrow, Thursday, June 27th at the Norman County Raceway in Ada, MN. Rain events have shortened or cancelled many of the circuit's races this year. The pits open at 3:00pm for drivers and crews. The draw begins at 4:00pm and is cut off at 6:15pm. Racing starts at 7:00pm. The track may not be conducting hot laps. Austin Pierce, driving his 2A sprint, will work to maintain his NOSA points lead. 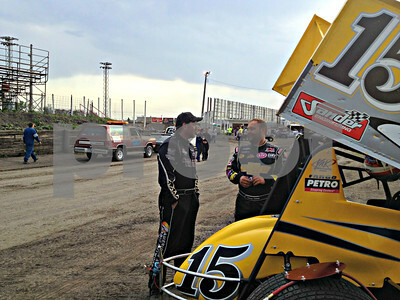 Donny Schatz, of the World of Outlaws, will be in attendance racing his Schatz Motorsports car. Chris Ranten, a regular NOSA points contender, will be running a new car, after he suffered a crash while racing with the WoO at River Cities Speedway in Grand Forks last Friday. NOSA will continue their weekend tour with a race Saturday at Greenbush Racepark in Greenbush, MN. June 24 2013 Grand Forks ND: NOSA Sprints' Austin Pierce will be defending his points lead this week as the team travels to Norman County Raceway (Ada, MN) on Thursday, June 27 and Greenbush Racepark (Greenbush, MN) Saturday. Pierce is holding the NOSA points lead for the first time since his sprint car racing career began in 2009. Several NOSA sanctioned races have been rained out this year, but Pierce is still getting laps in participating in other events. Pierce raced with the World of Outlaws over the weekend at Grand Forks' River Cities Speedway and I-94 Speedway in Fergus Falls, MN. "We didn't get the results we wanted," Pierce stated "I definitely used the weekend as a learning experience." However, qualifying for the A-Main with the Outlaws is a significant accomplishment, and one Pierce was able to achieve twice over the weekend. 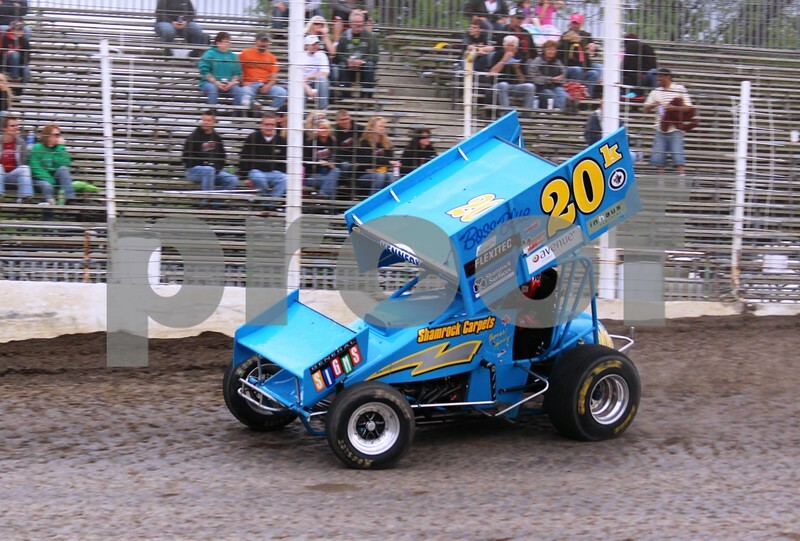 Pierce also raced in the sprint 410-360 race at Casino Speedway in Watertown, SD over the weekend. Pierce took the race lead on lap 3 and managed to maintain it until 2 laps remained, when he was passed by Jason Solwold for the win. Pierce has been using these opportunities to gain experience on the track. Gaining experience is just one of the reasons Pierce gives for his success this year. He recognizes the contributions and dedication his crew has been showing at the track and in the shop this year; "Each guy on my crew has taken on their own responsibilities. They make sure those get done each and every week." Pierce also understands the importance of being consistent with his performance. "Consistency is one of my main goals for this season, if you're not consistent, you can't make a run for a points title." Pierce is looking forward to racing at the some of the circuit's smaller tracks, including the rescheduled race at Buffalo River Race Park in Glyndon, MN. That race has been rescheduled for July 7th. The NOSA Sprints will not be racing at Pierce's favorite track, River Cities Speedway, this Friday due to the Grand Forks County Fair. NOSA's Mark Dobmeier placed 6th during Friday's World of Outlaws stop in Grand Forks, ND and also captured the feature win at Knoxville Raceway on Saturday and a third place finish at Husset's Speedway. Minot ND June 2nd 2013: #20K Thomas Kennedy of Winnipeg Manitoba Canada wins the Northern Outlaws Sprint Association Feature at NODAK Speedway in Minot ND while holding off a "Hard Charging the 5 Time World of Outlaw Champion #15 Donny Schatz" by 0.277 seconds. This cold wet weather has caused many tracks to cancel but word just came and Northern Outlaws Sprints will be running at Nodak Speedway in Minot on Sunday June 2nd. Green Flag Drops at 6:00PM See you there! NOSA Northern Outlaw Sprint Association Sprint Cars will not be racing tonight at Devils Lake Speedway as the races have been cancelled due to poor weather conditions. Please stay tuned as we will keep you posted on Sunday's race at Minot ND.